Oh Android you are a fickle creature.. So as you may have noticed I’ve been playing about allot with OpenGL and android recently and I started to see some very weird behaviour. The normal activity life cycle states that when the lock screen is enabled, the activity will be Paused, then Stopped. This seemed to be the behaviour I saw in the devices I was testing on until I tried a Nexus 4.. On lock it would Pause, Stop then Destroy.. WFT! and it would only do this on the Nexus 4. This caused me a big problem because the app I was putting together was a game, so if the screen locked in the middle of a game it wouldn’t just pickup from where it left it would restart the entire app and loose your progress… Not happy.. So I spent ages looking at my code to try to figure out what was going on and I stumbled across the following property when messing about in my OnDestroy method of the Activity. Hmm, what was that property about. Well it turns out this property tells you which configurations changed. When I looked at this when in my OnDestroy method I was it had a value of ScreenSize… Hmm A bit more research lead me to this from the android docs. Caution: Beginning with Android 3.2 (API level 13), the “screen size” also changes when the device switches between portrait and landscape orientation. Thus, if you want to prevent runtime restarts due to orientation change when developing for API level 13 or higher (as declared by the minSdkVersion andtargetSdkVersion attributes), you must include the "screenSize" value in addition to the"orientation" value. That is, you must decalareandroid:configChanges="orientation|screenSize". However, if your application targets API level 12 or lower, then your activity always handles this configuration change itself (this configuration change does not restart your activity, even when running on an Android 3.2 or higher device). So now it all makes sense.. When the nexus 4 (Andoid 4.3) was screen locking it was changing the Orientation to Portrait (helpful..not) which I was handling, but also raising a screen size config change, which I was not.. hence the OS destroying my activity. Normally when you get a new OpenGL based app in Xamarin.Android you get the following attributes added automagically to your activity. Now our app can be paused and resumed as normal when you lock the screen without it restarting. Yay! In my previous post we looked at how to modify the ScreenManager class to support multiple resolutions. This works fine but what we also need is a way to scale the inputs from the Mouse or TouchScreen so that they operate at the same virtual resolution as the game does. property Matrix InputScale ….. property Vector2 InputTranslate …..
InputScale is the Inverse of the Scale matrix which will allow use to scale the input from the mouse into the virtual resolution. InputTranslate needs to be used because we sometimes put a letterbox around the gameplay area to center it and the input system needs to take this into account (otherwise you end up clicking above menu items rather than on them). So we need to update the InputState.cs class which comes as part of the Game State Management example. First thing we need to do is to add a property to the InputState class for the ScreenManager. and then update the ScreenManager constructor to set the property. We now need to translate and scale the CurrentMouseState field into the correct virtual resolution. We can do that my accessing the ScreenManager property which we just added, so add the following code. This bit of code transforms the current mouse position and then scales it before creating a new MouseState instance with the new position values, but the same values for everything else. If the ScrollWheelValue is being used that might need scaling too. We use similar code to translate and scale each position and delta value from the GestureSample, then again create a new GestureSample with the new values. That should be all you need to do. This will now scale both mouse and gesture inputs into the virtual resolution. In my last post we looked at using ETC1 compressed textures on the Xamarin Android platform. In that case we just used the texture and some fancy shader magic to fake transparency. In this article we’ll how we can split the alpha channel out to a separate file which we load at run time so we don’t have to rely on the colour key. One of the things that can be a pain is having to pre-process your content to generate compressed textures etc outside of your normal development processes. In this case it would be nice for the artist to give us a .png file and we add it to the project and as part of the build and packaging process we get the required compressed textures in the .apk. XNA did something similar with its content pipeline where all the content was processed during the build into formats optimised for the target platform (xbox, windows etc), MonoGame also has a similar content pipeline as does many other game development tools. Pre-processing your content is really important, because you don’t want to be doing any kind of heavy processing on the device itself. While phones are getting more powerful every year, they still can’t match high end PC’s or consoles. In this article we’ll look and hooking into the power of msbuild and xbuild (Xamarin’s cross platform version of msbuild) so implement a very simple content processor. A .targets file in which we can hook into the Xamarin.Android build process at the right points to call our custom task. A way of detecting where the etc1tool is installed on the target system. We’ll start with the .targets file. First thing we need to know where in the Xamarin.Android build process we need to do our fancy bate and switch of the assets. Turns out after looking into Xamarin.Common.CSharp.targets file the perfect place to hook in is between the UpdateAndroidAssets target and the UpgradeAndroidInterfaceProxies target. At the point where these targets run there is already a list of the assets in the project stored in the @(_AndroidAssetsDest) property, which is perfect for what we need. Getting the location of the etc1tool is also a bit of a breeze because again Xamarin have done the hard work for us, there is a $(AndroidSdkDirectory) property onto which we just need to append tools/etc1tool in order to run the app. So thats 2) and 3) kinda sorted. Lets look at the code for the custom Task. I’m not going to go into all the in’s and out’s of writing msbuild tasks, that is what google and bing are for :). But if you look at the code we have two [Required] properties , the AndroidSDKDir and the InputFiles. The InputFiles are going to be the list of files we get from @(_AndroidAssetDest) and the AndroidSDKDir is obviously the $(AndroidSdkDirectory) property. We also have an OutputFiles property which we use to populate a list with our new files once we have converted them. The code in the Execute method itself should be fairly easy to follow. For each of the files we extract the alpha channel and save that to a .alpha file, then call out to the etc1tool to compress the .png file to an .etc1 file, note we also deleted the original file so it does not get included in the final .apk. Don’t worry this is a file in the obj/<Configuration>/assets directory not the original file we added to the project :). Now we could make this more robust and make it conditional so it doesn’t compress every .png in the assets list , but for now this will do the trick. So with the task code done, the .targets file now looks like this. This worked for me in Xamarin Studio on the mac, and it sort of worked in Visual Studio on windows. However in both IDE’s if you want to change the Task code you need to close and re-load the IDE since the assembly gets loaded during the build process and cannot be overwritten after that. So with the msbuild task stuff hooked in, you should now be able to add a .png file to your assets folder and have it produce a .etc1 and .alpha for that file in your .apk. After that you can just load the .etc1 and .alpha files as you would any other resource. The code for this blog entry includes a sample project so you can see exactly how to load the files and use them for alpha. Add support for Resizing to a Power of 2 (POW2) ETC1 only supports POW2 textures I think.. PVRTC certainly only supports POW2. Add support for Colour Key, this wouldn’t save the .alpha file. Add support for compressing the alpha channel to etc1. I’ll leave these ideas with you at the moment, I might look at implementing them myself at some point in the future. I know I mentioned looking at PVRTC , ATITC and S3TC texture support in my last article and I assure you I will get to that soon. In the meantime have fun playing with the code and I hope you find it useful. The code for this blog entry can be downloaded from here. When developing for iOS or Windows Phone you don’t really need to take into account different screen resolutions. Yes the iPhone and iPad do scale things differently but on the iPad you provide some special content which will allow the system to scale you game and still get it to look nice. On android its a different environment, there are many different devices, with different capabilities not only with screen resolutions but also CPU, memory and graphics chips. In this particular post I’ll cover how to write you game in such a way that it can handle all the different screen resolutions that the android eco-system can throw at you. One of the nice things about XNA is that its been about a while and when you develop for Xbox Live you need to take into account screen resolutions because everyone has a different sized television. I came across this blog post which outlines a neat solution on handling this particular problem for 2D games. However rather than just bolting this code into a MonoGame android project I decided to update the ScreenManager class to handle multiple resolutions. For those of you that have not come across the ScreenManager class , it is used in many of the XNA samples to handle transitions of screens within your game. It also helps you break up you game into “Screen” which make for more maintainable code. The ability to set a virtual resolution for the game.This is the resolution that you game is designed to run at, the screen manager will then use this information to scale all the graphics and input so that it works nicely on other resolutions. Expose a Matrix property called InputScale , which is the inverse of the Scale matrix so we can scale the Mouse and Gesture inputs into the virtual resolution. Expose an Vector2 property called InputTranslate so we can translate our mouse and gesture inputs. This is because as part of the scaling will will make sure the game is always centered, so we will see a boarder around the game to take into account aspect ratio differences. We need to define a few private fields to store the virtual width/height and a reference to the GraphicsDeviceManager. Next we add the new properties to the ScreenManager, we should probably have local fields for the these as it will save having to allocate a new Vector2/Viewport/Matrix each time the property is accessed. But for now this will work, we can optimize it later. The constructor needs to be modified to include the virtual Width/Height paramerters and to resolve the GraphicsDeviceManager from the game. // we don't assume the game wants to read them. Next is the code to create the Scale matrix. Update the Scale property to look like this. We use the updteMatrix flag to control when to re-generate the scaleMatrix so we don’t have to keep updating it every frame. Now implement the CreateScale method, this method will return a Matrix which we wil use to tell the SpriteBatch how to scale the graphics when they finally get drawn. So what we have done so far is coded up all the properties we need to make this work. There are a few other methods we need to write. These methods will setup the GraphicsDevice viewport and ensure that we clear the backbuffer with a Color.Blank so we get that nice letterbox effect. First thing to do is to update the Draw method of the ScreenManager to call a new method BeginDraw. This method will setup the Viewports and Clear the backbuffer. You will need to pass in the resolution your game was designed for, in this case 800×480. This should be all you need. In the next post we will look at the changes we need to make to the InputState.cs class to get the mouse and gesture inputs scaled as well. You can download a copy of the modified ScreenManager class here. So you have a great android project you are working on. It might be a game or an app it doesn’t matter, the key thing is you have a ton of Assets you want to include. Not Resources, i.e stuff you find in the resources folder like layout/values etc, but Assets we are talking graphics, sound, music you name it. What you can do is write an Extension method for the Android.Content.Res.AssetManager which will conditionally look in the Assets in the .apk or get that data from an external file. So we upload all the assets in a zip file to the device and then just run the app with no assets in it what so ever. We get quick build and debug times and we only need to update that zip file if the assets change or stuff gets added. So I put together this. Add it to your project. Call AssetMgrExt.Initialize(“/mnt/sdcard/Dowloads/blah.zip”) at the start of your app and AssetMgrExt.Close() at the end. Then replace all the calls to Assets.Open with Assets.OpenExt to get the data out (don’t forget to free up that memory stream 🙂 ). If you want to get an AssetFileDescriptor (i.e you use Assets.OpenFd) you can write a similar extension and mess about with ParcelFileDescriptor’s etc , but for my own purposes this worked out great. That is if for now. Happy coding! So in my last post I explained a challenge set down by my good friend @TheCacktus to write a game in 4 weeks. If you want to checkout the rules to this challenge read the previous post which has them all there. Over the last 2 weeks I have been desperately finding the spare time to design and write a game. The first week was the Design week. So I didn’t do any coding or start graphics or sound or anything, just design the game. Given its my first go at this (I’ve historically worked on game engines/api’s) I figured I’d start off slowly. Two weeks ago I was planning to sit myself down in a coffee shop and figure out what kind of game to write, action, rpg, platformer.. But life took and unexpected turn and I ended up going round a mates house for a curry.. First day lost. I was a bit more successful the following week, a few evenings after work I managed to nail down the idea. 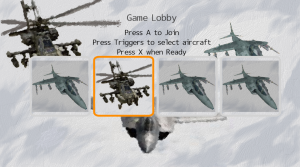 Basically a 2-4 player top down shooter using aircraft. The player is able to pick from 3 different aircraft, the legendary BAe Harrier or AV8 for the American’s out there.. and yes sorry to say that that wonderful jet the US Marine corps uses is British designed. The F35B the Harriers future replacement, and the AH-64 Apache Gunship. I picked these aircraft for a number of reasons, principally they all have some ability to fly backwards. Obviously the Apache is will be as fast as the two jets going forward, but it can go just as fast backwards as it can forwards and I thought this might be interesting to try out. As will all game designs things may or may not work out. 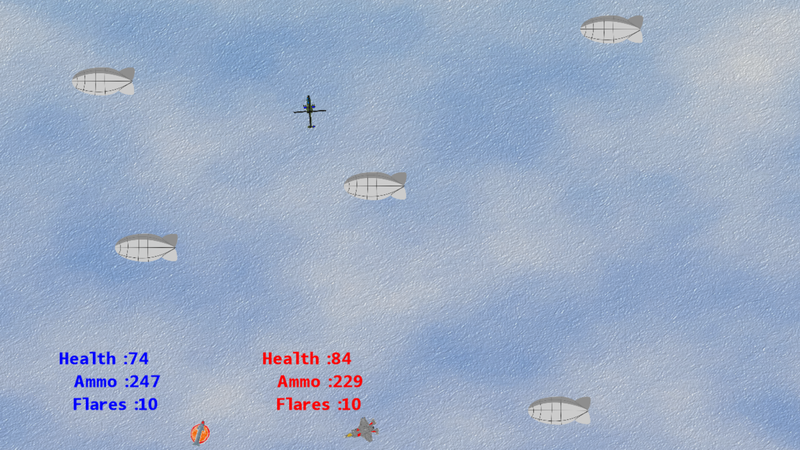 For weapons I decided that all aircraft will have a cannon with 300 rounds in it. That is the default weapon, the game will drop an ammo picked every few minutes so people can top up. There is also a 4 round Air – Air missile pickup which might drop. This gives the player 4 missiles which do more damage than a cannon bullet. But the only ‘lock on’ to a target you a facing so its’ no go firing it in the other direction. Each aircraft has a set of 10 flare packs as well, these can be used to avoid the missiles but the plan is it will take some skill and might not always work. The game win condition for the game is last man standing, while I didn’t think of it at the time and it’s not in the game I can use stat’s like number of rounds fired , number of hits, number of collisions etc to issue awards at the end of each match. This idea occurred to me during the coding week, but as I was following the rules I can’t add it till after the test/review phase. I think I spent about 6-8 hours in that first week working on the design and figuring out what I wanted to do. In hindsight that could have probably spent a bit more time on it. Now for the coding, this was really hard. 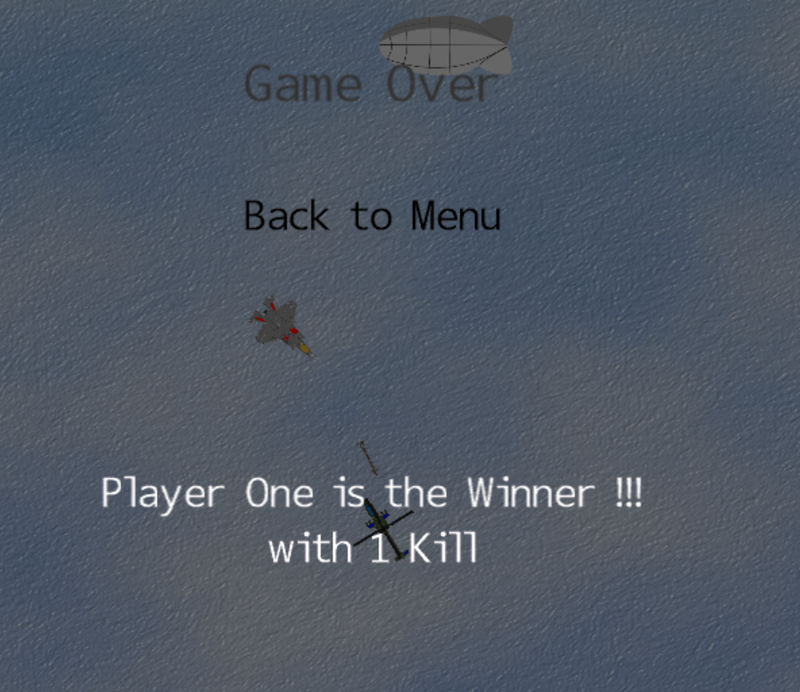 I had a busy week at work/family so I only had the evenings and the weekend to code up the game. I think the total hours I spent on this was in the region of 24-28 hours, which isn’t bad it averages out at about 4 hours each evening. I made a couple of important decisions before starting to code, I had a few suggestions before I started to use engines like Unity, Marmalade or Moai for the game but in the end I decided to stick with XNA. The great thing about XNA is it has a whole bunch of Samples you can use to base your games on. I started of by downloading the GameStateManagement sample, this sample provides you will a framework for transitioning between and Menu screen to Options and Gameplay etc. You could waste hours writing that stuff yourself, you are better off using existing code. There was a temptation to base the code on the excellent NetRumble sample to start with, but I decided against that because it was a full game already and I wanted to write the code ‘game’ myself. 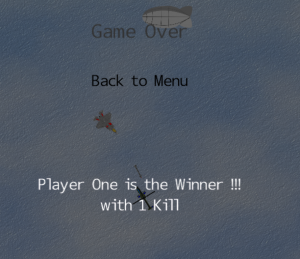 That said I did borrow the CollisionManager and Weapon system from NetRumble, it was fairly extendable and the Weapon system made implementing my own weapons easy. One of the hard parts was implementing the IR Missiles, getting it to turn towards a aircraft was fairly straight forward, implementing a limited line of sight was a bit more problematic to get right. I’m still not entirely happy with the results as the missile tends to turn before its even left the aircraft rather than waiting a while before it starts to lock-on. But then again I didn’t put that in the spec so I didn’t change it. I had some weird bugs during testing which boiled down to me not clearing the CollisionManager between games, so I ended up with ghost objects in the game that players would collide with. Other than that it went pretty smoothly, I think the key was to keep the concept simple to start with. Reusing existing code and samples helped allot, I don’t think I would have done it in the time otherwise. For graphics, being somewhat artistically challenged I decided to make the most of the tools I had available. I used a Windows Store app called Fresh Paint. This is a cool artistic app that is great on a Surface RT/Pro, the Pro much more so because you can use the Pen. It has a cool feature of being able to take images and do a water color version of them. 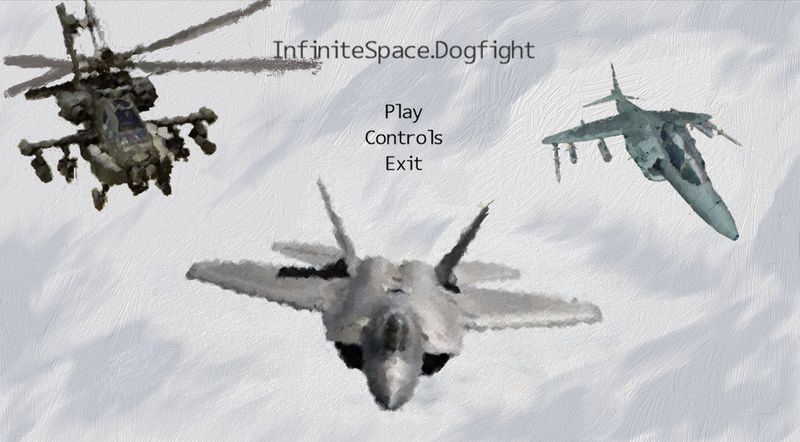 So I simply did that on all the graphics I had, it might look like I painted all the menu screens but I didn’t ;). I think it turned out very well considering I spent about 2-3 hours of the total coding time on graphics. The sounds effects we courtesy of my voice and Audacity, its amazing what you can do with your own voice, I’m surprised more game developers don’t do it if I’m honest. So the next week is the testing/review phase. I’ve sent the game out to a few friends to test and feedback, hopefully they will have time to play it otherwise I’ll have to ditch it all and start again. After this week we have one more week of polish and implanting the feedback before I have to release the app, not entirely sure where to release it yet though. I might try porting it to OUYA in that last week and see how that works. Anyway for those of you wanting to test it out you can get the zip file of the release here. MonoGame – Continuous Integration with Travis CI. Indie Game Developers Get Xamarin iOS/Android for Free. Carlos on I am back! harshit goel on I am back!